We all know that moment where your website has grown to this monstrous collection of pages. That moment when you realize that you have too many pages in your menu and the coherence of your website is nowhere to be found. And we also know what a struggle it is to clean this mess up. In this article, I’d like to go over a number of things we would take in account (at least) when changing your site structure. It’s a tough job, and sometimes it takes a lot of rewriting and perhaps even creating new pages, but as it is a job we have postponed way too long already, why not start restructuring today. The visual structure of your website is, in most cases, presented by the menu of your website. Of course breadcrumbs and permalinks help a lot here as well, but these are not the things an ordinary visitor will take in account. The menu is. Your menu ideally consists of a limited number of top level items, to keep the website focused. My personal preference would be to create at most one sublevel, but I know this will get some criticism from customers stating that they “can’t squeeze all they have to say in just a few pages”. Please realize there are more ways to get from one page to another and your menu isn’t the only navigational option on your website. More information about this can be found in our Optimize your (WordPress) site eBook. For the majority of websites, the menu starts with the Home item and ends with the Contact item. We’re used to that, and every time we review a website that lacks either one of them, the menu just doesn’t feel right. Everything between these two items should be related somehow. Either list the main product groups or focus areas of the website. One of the sites we’ve reviewed has three major interest areas: freediving, scuba diving and spearfishing. It is clear that these items have a link between them, and therefore the menu feels natural. If these menu items had been freediving, scuba diving and Dakar Rally, that wouldn’t feel natural, right? Keep things on-topic. If you have a diving website and want to write about your Dakar experience, I’m sure you can squeeze in a blog post or link to a specialized, optimized site about it. It doesn’t belong in your menu. This is your basic site structure. Joost did an excellent piece on cornerstone content that we refer to on a daily basis. Cornerstone content (in short: assigning one main page per content and linking that from related pages) shows how internal links contribute to your site structure. Although menu links are the most visible, if a visitor is reading an article and wants to know more about the subject at hand, a link in the text is more easily found than a menu item that relates to it. More information about site structure can be found in our Content SEO eBook. Not all steps need to be in the menu (perhaps just Web Development and WordPress would be enough), but all pages in your site structure should ideally be set up and optimized. It will create a rich collection of pages that strengthen each other. By the way, I am sure more that one step in this example also has links to other pages in your site structure, as it belongs to other collections of pages as well. What I expect, is that you’ll also find pages that need urgent updating or worse: that actually shouldn’t be on your website or simply don’t fit the current or new site structure. Services you used to offer or information that just isn’t accurate anymore. Write these pages down or copy the URLs to a text file. Is there a way to redirect (301) these pages, like with our Yoast SEO Premium plugin? Preferably you should redirect the URL to a related article, to preserve any traffic that this page had. If that related article doesn’t exist, redirect to a related category page, or as a last resort to your homepage. This way the (outdated) page won’t interfere with your site structure anymore. By the way, be sure to read this nice post on analyzing your own content by Everett Sizemore: How To Do a Content Audit – Step-by-Step. Our Yoast SEO Premium plugin is currently in Summer Sale! Save up to 33% on your license and even more if you extend your license now! When using WordPress, an obvious site structure is provided by the Categories and Tags you have divided your posts and perhaps pages in. In WordPress, these are called ‘taxonomies’. We have mentioned this before, but 8 to 10 categories would suffice for a website. Perhaps a webshop could have more, but the top level should preferably consist of that number of categories to keep your site and site structure focused. We’ve seen sites using over 300 categories, accompanied by over 5,000 tags and more. That’s not structuring your website, that’s messing up your site structure. For me, the basic guideline is that if I don’t think I will reuse a tag, I won’t apply it to a post. And if an eleventh category would knock on my door, I’d probably wonder if the website could use another taxonomy next to categories and tags. 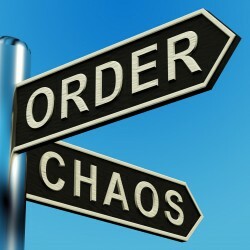 There are several WordPress plugins that can help reorganizing taxonomies, but most of them don’t seem to add redirects after merging or deleting taxonomies – be sure to do that, of course. Although one can write this down in a couple of paragraphs, it could be a lengthy process that shouldn’t be taken lightly. When changing the structure of a large website, it could make sense to change the permalink structure as well, which can have a lot of consequences. In this article we focus on restructuring the site for user experience (and SEO), not on all the technical implications this might have if you want to take restructuring to the next level. In the unlikely case you have constructed your HTML sitemap manually, update that sitemap after changing your site structure. In the likely case you have an XML sitemap, resubmit it to Google Webmaster Tools. In case you have removed a page that just shouldn’t be in Google anymore, delete it from your website. Redirect that page to a page that is closely related to it. If you really don’t have a clue which page to redirect to, serve a 404 Not Found error. Drop us a comment if you have ever struggled with changing the site structure of a (customer) website. We’re looking forward to your stories. 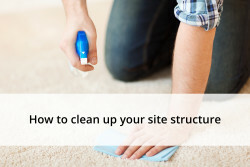 This post first appeared as How to clean up your site structure on Yoast. Whoopity Doo!